What became of Mary Stuart? Well, she was born in 1912, and grew old walking her land. In later years she relied on the reports of young Macoun members to keep herself informed of the natural happenings out at “the farm”. Finally, she arranged for longtime friend and wildlands neighbour Gerry Lee to take over the property, thus ensuring that the Macoun Club might continue to enjoy what she so generously called “roaming rights”. 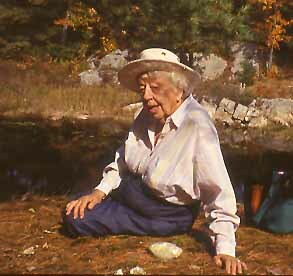 She died in the summer of 2004, at the age of 92. 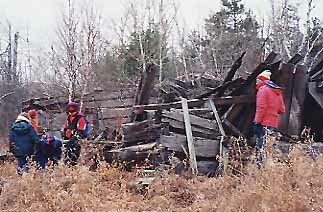 Meanwhile, the old log buildings have become ruins rather than relics. But all around them the natural world is flourishing, and that is our real destination. 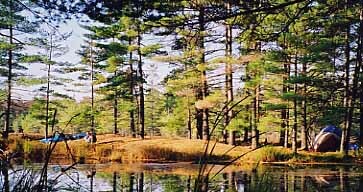 We raise our tents among the pines of Mary’s “upper lake”. At left, campers on Owl Point as seen from Rob’s tent. It is shown at right, with Mark Hickman standing beside it on Dec. 12, 1998. 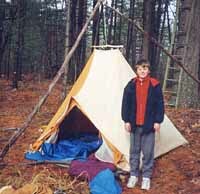 This old tent is made of Egyptian cotton, and it is suspended from a tripod of sapling poles. We make the most of every season, and in those rare years when freeze-up comes before snow, our field trips become skating parties. A film of rainwater over good ice is no exception (Nov. 27, 1993). 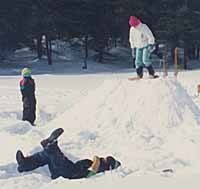 The best winter snows are good for snow houses, and this day, February 29, 1992, Solange was determined to have one. In fact, without exceptional determination, she wouldn’t even have been there. Solange’s family lived in the countryside, and their laneway was snowed in that morning. When the tractor wouldn’t start, and Solange’s father tried to fix it, his screwdriver snapped in the cold. “That,” he said, “is that,”. Solange protested: “This is silly. We’re too dependent on technology. We have to use our wits.” If they couldn’t plow their way out, she would have her whole family tramp a long pathway down to the road. It worked, and she was able to join the trip on time. At lunch, someone fetched a shovel and heaped up snow. Solange, on snowshoes, packed it down, and then we hollowed it out. Nine kids crawled inside, and Solange squeezed in after them. Stuffed full, it was warm inside within moments! Gerry Lee, like Mary, is a naturalist. But his cabin reflect some of his wider interests — its walls are ringed with moose and deer antlers, and turkey tails. 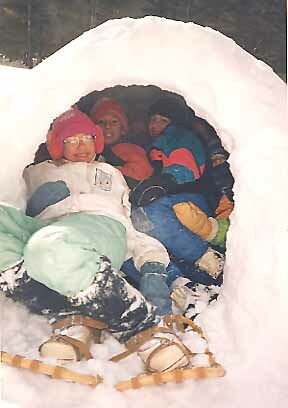 It has been a warm and welcome refuge for us during periods of deep cold, enabling us to “camp” in comfort (though some have always insisted on sleeping outside). 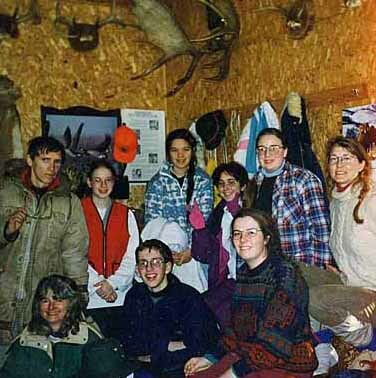 Here, in early January, 1996, are (standing, left to right): Rob Lee, Solange Courteau, Terri Oda, Chantal Deguire, Marlene Keeley, and Kim Sayers. Seated: Barbara Gaertner, William Godsoe, and Rebecca Danard. Outside, the temperature went to -32 degrees Celsius overnight. All photos donated or provided by members and leaders, past and present. Created Nov. 16, 2005. Coding revised in 2013 and 2016.